Dewalt Heavy-Duty 1/2 in. 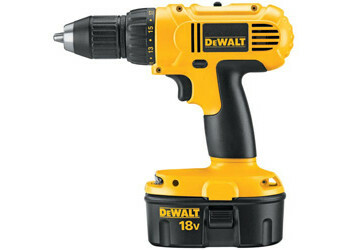 (13mm) 18V Cordless Compact Drill/Driver Kit. Compact size: fits into the tightest conditions. Lightweight design (5.2 lbs.) minimizes user fatigue. High performance motor delivers 450 in-lbs of maximum torque. Dual speed range: 0-450/0-1,500 rpm delivers optimal performance. 1/2" single sleeve keyless ratcheting chuck for tighter bit grip. Maximum durability and reliability withstands jobsite conditions.